A blend of old-fashioned lavender buds brings back memories of spring air freshness.The Air Freshener Enchant Fragrance importance comes from Air care need for protecting the air from bad odor and preventing insects from coming again . It is 100% eco-friendly and safe near food . Premium fragrances that eliminate odors - not just mask. with fresh tones of sea breeze combined with outdoor tones and a malodorous counteract ant. No CFC’s or ozone depleting substances. A blend of old-fashioned lavender buds brings back memories of spring air freshness. The Air Freshener Enchant Fragrance importance comes from Air care need for protecting the air from bad odor and preventing insects from coming again . It is 100% eco-friendly and safe near food . 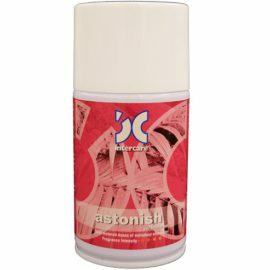 Why Intercare Air Freshener Enchant Fragrance ? Recommended for offices , restaurants , hospitals , food courts , markets , schools , prayer rooms .. etc. The common bottle size fits most of the dispensers in the market . 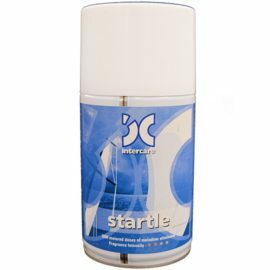 Intercare Air Freshener Enchant Fragrance Content : 270 ml .